A poor gear pump pressure control algorithm for the pump can cause some variation in the extruder screw speed, causing large variations in the inlet pressure to the pump. This type of control-induced surging can occur even though the process as designed is inherently stable. To determine if the gear pump pressure control control algorithm is inducing the surging, the screw speed of the extruder should be operated in a manual mode and at a constant speed. If the controller is inducing the surging, placing the process in manual control mode will stabilize the process. Transient process data were collected for an extruder with a downstream gear pump, as shown in Figure 1. For this case, the control algorithm was controlling the speed of the screw such that the inlet pressure to the pump was maintained at 8 MPa for a polycarbonate (PC) resin. Although the variation in screw speed was not excessive at 67+1.5 rpm, the variation in motor current seemed quite high at 540+90 A. At about 16 minutes into the run, the extruder was switched from automatic to manual screw control; i.e., the screw speed was held constant at 67 rpm. As shown by the data in Figure 7, the motor current variation was unchanged, indicating that the screw speed control algorithm was not inducing the variation in the motor current. During the period that the screw speed was held constant, the pressure to the inlet of the pump slowly increased, as shown in Figure 8. This pressure was increasing because the screw was operating at a speed that delivered a rate slightly higher than that needed by the pump. 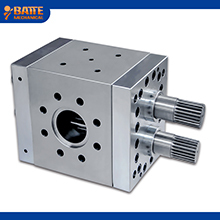 When the control was placed back into the automatic mode, the screw gear pump pressure control speed was decreased initially to compensate for the higher than desired pump inlet pressure.